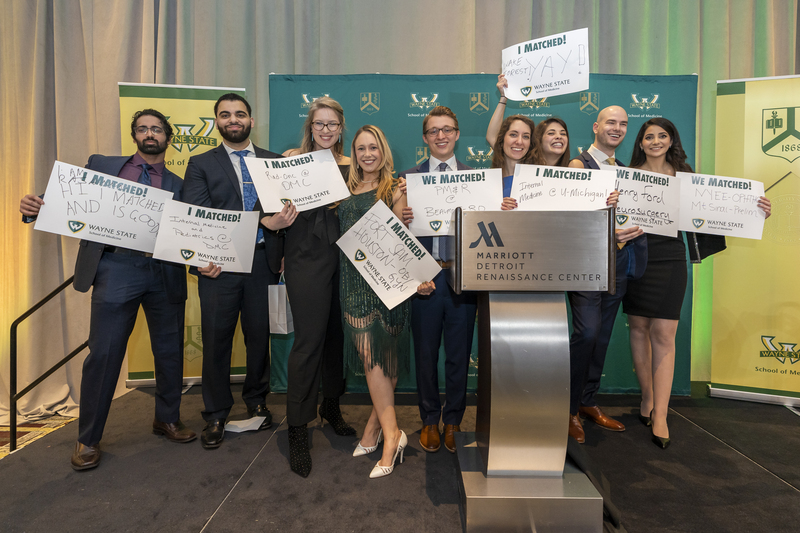 Match Day celebration for the Wayne State University School of Medicine Class of 2019, held Friday in a sprawling ballroom within Detroit’s iconic Renaissance Center, was the penultimate celebration for nearly 300 physicians in training who will graduate in June. Students react with hugs after finding out residency placements. Of the entire class, 98.16 percent matched with a residency program for which they interviewed. WSU students will fill residency slots in 26 different specialties, the top three being Internal Medicine, Family Medicine and Emergency Medicine. 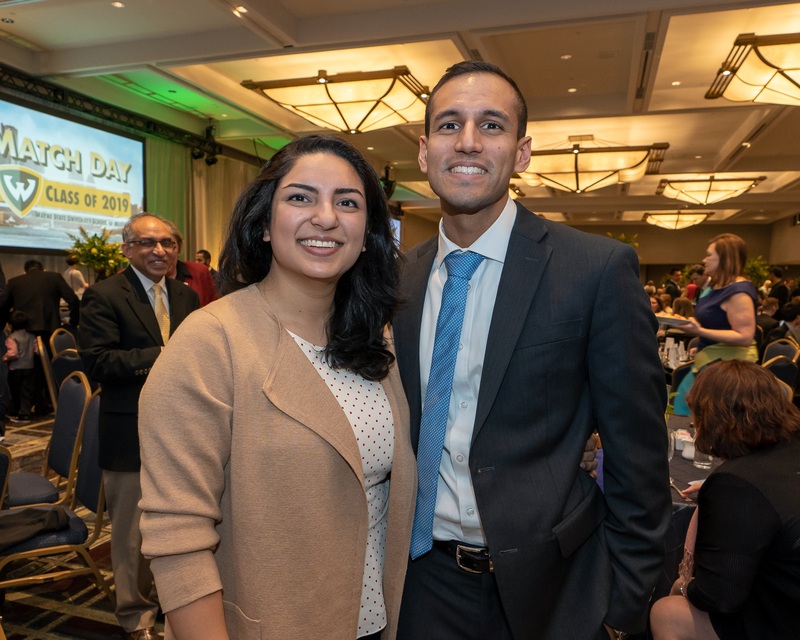 “I started crying even before I opened my envelope,” said Priya Mary Varghese, moments after opening the white envelope that told her where she would spend the next few years as a resident physician. The Toronto native will remain in the States, getting a slot in the Internal Medicine program at Albert Einstein Medical Center in Pennsylvania. The program was her No. 1 choice. “I’m just so excited. I was really nervous,” she said, tears in her eyes. Varghese’s friend, fellow senior Rima Nakrani, had a similar reaction to being placed in her top choice as well. She is also going to Philadelphia, where she will practice at Temple University Hospital. “I’m feeling good. Very happy. While I was opening the envelope, I was shaking,” Nakrani said. The Match Day event mirrored others held at medical schools throughout the country, and follows the protocol of the National Resident Matching Program, a private non-profit corporation established in 1952 to provide a uniform date of appointment to graduate medical education positions in the United States. Priya Mary Varghese, center, celebrates her Match with her parents Anita Varghese and Varghese Simon. About 900 students, faculty, staff and family counted down the seconds before their WSU sons, daughters, wives, husbands and siblings opened envelopes containing their residency assignment for the next three to seven years, depending on their specialty. Only minutes before the countdown to noon, envelopes were placed in the hands of the 272 senior student match participants in the Class of 2019. WSU’s match rate surpassed this year’s national average match rate of 93.9 percent for allopathic students, in a year that saw 38,376 applicants apply for 35,185 available residency positions in the United States. A total of 19,417 U.S. seniors participated in the Match. Students found out March 11 whether they matched with one of their preferred residencies, following interviews that began in late 2018. From mid-January to late February, applicants and program directors rank each other in order of preference and submit preference lists to NRMP, which processes them using a computerized mathematical algorithm to match applicants with programs. The Class of 2019's Michael Dix, right, celebrated Match Day with his wife Aly and 6-month-old daughter. “From all the kids who applied, they wanted you. They wanted to invest in you as a person,” Entyre added. The physicians-in-training will receive their medical degrees in a commencement and hooding ceremony in June, and begin residencies in July. Thirty-four percent of the students matched with one of their first three program choices, including Michael Dix, who brought his wife, Aly, and their 6-month old daughter to the Match Day festivities. His first pick was a General Surgery residency with Henry Ford Health System. “We don’t have to move. It’s great,” he said. The couple started dating 11 years ago, in high school, and married a week before he started medical school. Anjali Alangaden, a first-year M.D. student, celebrated her brother Keith Alangaden's match. Like Dix, a hefty 50.3 percent of WSU’s Class of 2019 are staying in Michigan. The increase is great news for a state with a projected physician shortage, as studies show that residents who train in Michigan often remain here for the majority of their careers. Another 30.1 percent will enter primary care residencies, which includes Internal Medicine, Family Medicine, Pediatrics and other specialties. Overall, 20 Michigan-based health systems and centers will welcome Wayne State University graduates to residencies this summer, including 36 to the Detroit Medical Center, 19 to the Henry Ford Health System, 18 to the Beaumont Health System, 16 to the University of Michigan and 14 to Ascension St. John Providence. Internal Medicine residencies were the most popular clinical discipline at WSU this year, with 41 students entering the specialty. Another 27 students will enter Emergency Medicine programs and 25 will enter Family Medicine. Diagnostic Radiology, Psychiatry and General Surgery were also popular choices. Students moving out of state will practice medicine in 29 states and one Canadian province, including 17 each in Illinois and California, 12 in Ohio and 11 in New York, at more than 125 hospitals, universities and medical centers. They include Wayne State University, Yale-New Haven Hospital, Mount Sinai Medical Center, Vanderbilt University Medical Center, Brigham & Womens Hospital, Duke University Medical Center and Mayo Clinic School of Graduate Medical Education. Leonard Tow Humanism in Medicine Award (Faculty): Erin Miller, M.D. Class Marshal: Barbara Bosch, M.D. Voluntary Faculty Awards: Scott Yaekle, M.D., and Richard Bryce, M.D.